Labels for the front panel were printed on a full sheet inkjet printer label, cut out and applied to the panel. If I were to do this layout again, I would reverse the positions of the output control and output connector (a cable attached to the connector sometimes gets in the way of operating the power control knob). 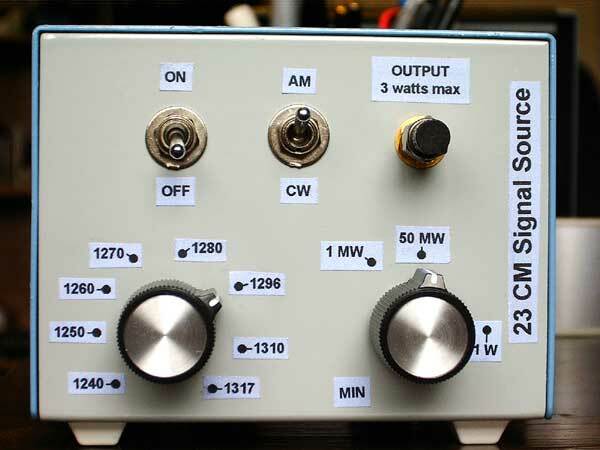 I used an SMA connector on the output, shown terminated with a 50 ohm load in this picture. A type N, or even a BNC connector would have been O.K. as well. The chassis box is not custom, it is a standard LMB product.